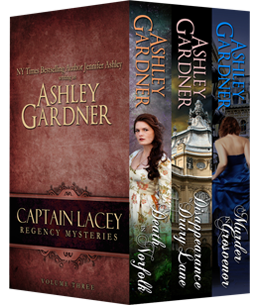 A collection of Books 7-9 in the Captain Lacey Regency Mysteries. In A Death in Norfolk, Lacey travels to his boyhood home in Norfolk to allay the past, and becomes caught up in mysteries surrounding the Lacey estate. In A Disappearance in Drury Lane, Marianne Simmons asks Lacey to look into the disappearance of an actress from the company at Drury Lane. Lacey does so to find the problem far more complex and dangerous than he anticipated. Meanwhile, he has a very important appointment to keep with Lady Breckenridge. In Murder in Grosvenor Square,Lacey is shocked by the murder of a friend and vows to bring the killer to justice. Join Captain Lacey, Lady Breckenridge, James Denis, and new characters for more murder and mayhem in Regency England.